It doesn’t get much more simple or savory than this side dish. I personally think fennel is both under appreciated and under used so give it a try. If you don’t know fennel well, this is a simple and delicious introduction. Trim stock end and bottom end of fennel and then cut in half and dig out hard center. 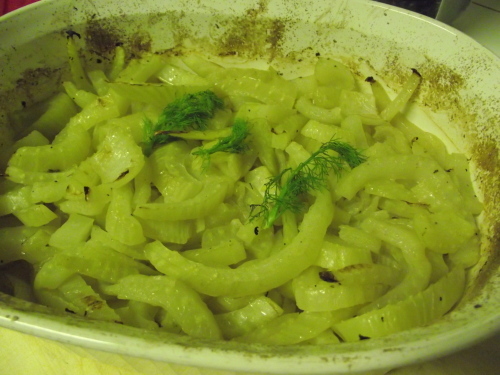 Slice fennel and onion, place in a baking dish and add chicken stock and oil, salt & pepper. Toss lightly, throw in butter and bake for 1 hr at 300.